The first worship services were held in Wamego in 1868. On May 22,1870, St. Luke’s Mission was organized. The church building was consecrated in 1900, the bell tower was consecrated in 1921 and the Guild Hall in 1925. Since those early days St. Luke’s has worshiped and served in the community of Wamego. 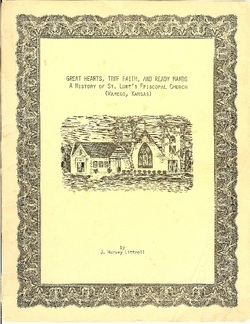 Click on the picture to the left to read Great Hearts, True Faith and Ready Hands, A History of St. Luke's Episcopal Church by J. Harvey Littrell, a history of our church from its beginnings through the 1980s.